lt;stronggt;CWNSSR035CHlt;/stronggt;lt;BR/gt;Super Soaker Wiper Mat with Gripper Bottom, 34 x 58, Charcoallt;BR/gt;Need help getting a grip on dirt and moisture Loop pile polypropylene fibers remove dirt and moisture, keeping your home or office clean and safe. The no-slip bottom creates a secure grip to carpets and smooth floors. Equipped with rubber backing and edges. Vacuum or professionally clean. 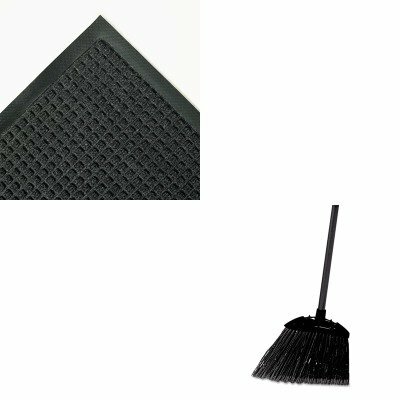 Mat Type: Wiper Mat Application: Indoor Materials: Polypropylene.lt;BR/gt;lt;BR/gt;lt;stronggt;RCP637400BLAlt;/stronggt;lt;BR/gt;Super Soaker Wiper Mat with Gripper Bottom, 34 x 58, Charcoallt;BR/gt;Cut and shaped for easy sweeping in hard-to-reach areas. Flagged, acid-resistant polypropylene fill bristles. Will not stain, discolor or absorb odors. Can be used wet or dry. Overall length 35amp;quot;. Application: Spot Bristle Material: Polypropylene.